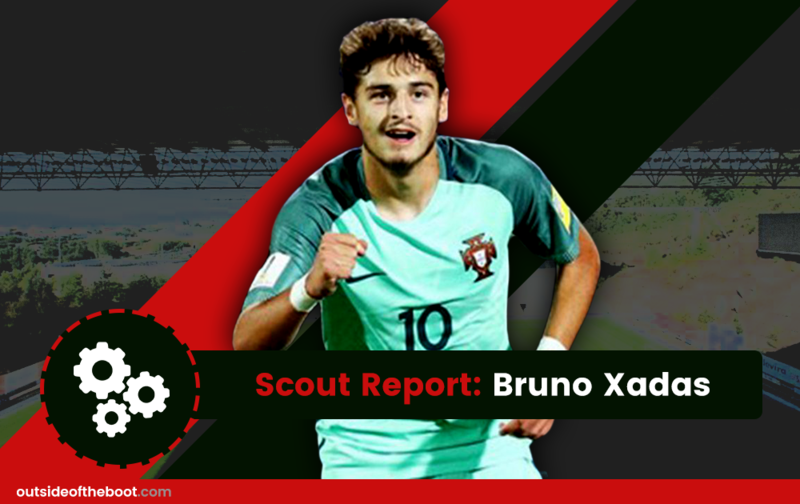 Jose Miguel Saraiva takes a close look at Braga youngster Bruno Xadas, a man who is expected to take the world by storm soon. Braga is not quite famous for the success of its youth teams’ in bringing through players that succeed at the highest of levels, but the most recent signals allow us to foresee a shift in the Portuguese club’s paradigm. Along with the recent millionaire transfers of Braga’s young stars Pedro Neto and Bruno Jordão to Lazio, Bruno Xadas has also been collecting fans and admirers for the last 2 seasons, but the 2017/18 seems to be that of his definite affirmation. Bruno Alexandre Vieira Almeida, also known as Bruno Xadas, was born on 2nd December 1997 in Oliveira de Azeméis, Portugal. He started playing football in 2005 at Milhoeirense, and remained there until 2008. In 2008, when he was 11, he signed for FC Porto, where he played for Porto’s youth teams during 2 seasons until the season of 2009/10. He went to play for the third-tier club Sanjoanense and remained there until 2013/14, playing for the youth teams. In the season of 2014/15, he signed for Braga and stood out when playing for the Braga U19 team. During the 2015-16 season, he enjoyed his best season in his whole youth career, making 21 appearances and scoring 14 goals. In the following season, he played mainly for the Braga’s B team, making 30 appearances and scoring 11 and he also made his debut for the Braga A team, playing 4 matches. Thanks to those two beautiful last seasons, he earned an indispensable spot in the Braga squad and has been the team’s star so far in the 2017/18 season. In terms of Xadas’ international achievements, the 19-year-old player made his international debut for the Portuguese national U19 team, having made 8 appearances and scored 1 goal. For the U20, side he made 10 appearances, 5 of which came in the 2017 U20 World Cup where he scored 2 goals. He still hasn’t played for the U21 team, especially due to his young age, but such achievement certainly comes close. Bruno Xadas has been attractomg the interest of major teams in Portugal and other foreign teams, but the €25 million termination clause has held this formidable player to Braga, where he is preparing to be one of the most influential player at the side from the north of Portugal. Bruno Xadas has always been a natural centre-midfielder or attacking centre-midfielder, positions where he played since his youth teams years in Sanjoanense and Braga. Nevertheless, since 2016/17 he has been mostly used as right-winger or somehow a right-midifielder and it is in that position where he has made some brilliant appearances so far this season. Bruno Xadas makes use of his intelligence, as well as his technical capacity, to make his way up and down the right wing but is also very effective and productive in making a more interior play, from the right, which makes him an important piece in the attacking transitions of his team. Also, Bruno Xadas is very keen on making rupturing movements and escaping the marking of the opposing defenders, and as soon as he is granted some space, he usually makes a very good use of it, always posing a threat to his adversaries. Bruno Xadas has, in the last couple of years, developed his skills at an outstanding pace and has grown to become a very complete and admirable player. His main qualities are his technical ability, his pace and his creativity. He, either playing on the right wing or in the centre of the terrain, always plays a crucial part in the attacking transitions and in the construction stage of his team as he is very good technically and very capable of leading the team’s game forward either by carrying the ball and approaching the opposite box or by picking out teammates up front and perfectly delivering the ball to them. He is also a very quick player and that also helps him in being dangerous when he attempts to make decisive movements in the last third of the field. His creativity, along with his technical ability is also one of his main weapons and perhaps his most evident attribute as Xadas is able to sometimes invent a good solution even in situations where he has little space and time to do so, seldom losing the ball. Bruno Xadas, as stated before, is a very complete player but still has some aspects he ought to improve upon. He, despite being very creative and reasonably intelligent, needs to improve his decision-making. The definition of a team’s game requires great maturity, intelligence and experience and that is an aspect on which Xadas should work but I reckon that only by being given lots of opportunities and playing many games will Bruno Xadas acquire the necessary maturity and experience to better perform in the aspect of the definition of the game. Also, he is not particularly gifted when it comes to heading and he could also improve on that aspect, although it isn’t a crucial attribute to his playing but could make him a more complete athlete. In order to be a world-class winger or attacking midfielder, Bruno Xadas should also improve on his capacity to score goals and be much more influential in the goal-scoring aspect. Creating opportunities and leading the team’s game is a part he plays well, but he could use a bit more of a scoring instinct to be able to score many more goals and to bring more positive and influential consequences to his beautiful actions. Each one of these flaws can certainly be improved if Bruno Xadas is given opportunities and the minutes to grow as a player and to develop in order to reach for higher stages of the world football, which I believe he has all the potential to achieve.